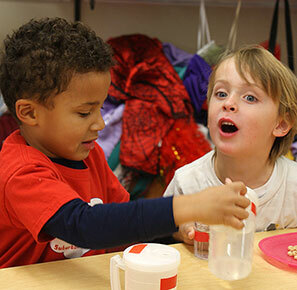 The primary mission of the Redbird program is to encourage continued growth in the areas of physical, emotional, social and cognitive development. The use of play, experimentation and hands-on experience are vital tools for achieving these goals. The class’ daily schedule supports this approach by providing a focus and rhythm to the school day. Incorporating appropriate educational tools and materials enables each child to learn at his or her own pace and ability. The primary focus is on each child’s individual development, with special emphasis placed on retaining individuality while learning to function within a group. 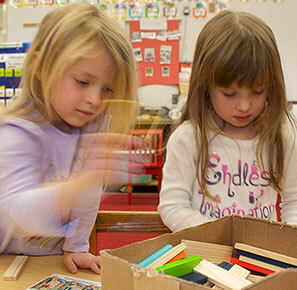 The activities and curriculum in Redbirds are designed to engage children in age-appropriate learning in range of subjects and to ensure that they are ready to transition into a kindergarten program. 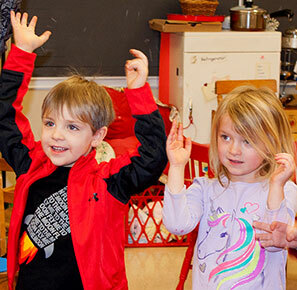 Regular classroom activities include: music, art and fine motor projects, games and puzzles, imaginative and dramatic play, science and nature exploration, examining literature, outdoor exploration and play, large-motor activities and individual responsibility through classroom jobs. The Redbird class generally consists of fourteen to sixteen children, all of whom attend five mornings a week. There are two co-oping parents in the class each day. For information on co-oping responsibilities for Redbird families, please see the Admissions and Our Approach sections.